(L to R) Falsterbo Show Director Jan-Olaf Wannius, FEI Commercial Manager Nathalie Taylor, British Chef d’Equipe Rob Hoekstra, German Chef d’Equipe Heinrich Hermann Engemann, Swiss Chef d’Equipe Stephane Montavon and Irish Chef d’Equipe Robert Splaine. Photo: FEI/Lotta Gyllensten. Falsterbo (SWE), 12 July 2012 – The host nation will be feeling the heat as the sixth leg of the FEI Nations Cup 2012 gets underway on home soil in Falsterbo, Sweden tomorrow afternoon. Drawn second-last to go, Sweden also lies seventh of the eight competing nations on the series leaderboard, sharing the same score as the bottom-placed Irish whose aggregate score has them at a slight disadvantage. For both sides, tomorrow is a crunch clash as they attempt to pull themselves off the wrong end of the league table with only two further legs of the series remaining after tomorrow’s competition. And today’s draw was not kind to the Irish who will be first into the ring at 14.30 local time. The order-of-go is as follows: 1, Ireland; 2, Germany; 3, Great Britain; 4, Switzerland; 5, Netherlands; 6, France; 7, Sweden; 8, Belgium. Germany holds a handsome lead in the series after a double of wins, at Rome (ITA) in May and Rotterdam (NED) in June, and consistently good placings including runner-up spot in Aachen (GER) last week where the French came out on top. German Chef d’Equipe, Heinrich-Hermann Engemann, has Jorg Naeve, Tim Rieskamp-Godeking, Thomas Voss, David Will and Holger Wulschner in the pool from which he will choose his team. And although these are not the biggest names in German jumping, they are a very experienced bunch and are likely to live up to their team manager’s expectations that they will “pick up some more points”. The Netherlands, boosted by victory at St Gallen, Switzerland last month, lies second on the leaderboard, but the Dutch are 11.5 points in arrears. Like many of the top team managers, Rob Ehrens is concentrating on preparing his side for the forthcoming London Olympic Games while also attempting to ensure his country holds position on the FEI Nations Cup leaderboard, and he’s is relying on Mathijs van Asten, Jeroen Dubbeldam, Hendrik-Jan Schuttert, Suzanne Tepper and Leon Thijssen to do the latter. The Swiss share the same number of points as the Dutch but are in third going into this latest leg of the series, and Chef d’Equipe, Stephane Montavon, was buoyed up by good news for his side today. “Yes, we hope to achieve at least as good as today’s class – which we won!” he said, after Arthur da Silva steered La Toya to victory in the 1.50m Vellinge Kommuns Pris. With Clarissa Crotta, Christina Liebherr, Gregoire Oberson and Martin Fuchs – the latter carving his career in the footsteps of his father Thomas and uncle, Marcus, who were both Olympians – on the Swiss squad, Mr Montavon’s wish may just come true. And for young Mr Fuchs it will be a very special day no matter how things work out, as he celebrates his 21st birthday tomorrow. The French will be galloping into the ring with their heads held high after their tremendous success in the fifth leg at Aachen last Friday night. And, lying a close fourth on the league table, they may well build on that tomorrow as Chef d’Equipe, Pascal Dubois, will be sending out another strong side chosen from Penelope Leprevost, whose spectacular double-clear with Mylord Carthago was pivotal to last week’s victory, Jerome Hurel, Marc Dilasser, Amyeric De Ponnat and Olivier Robert. The Belgians started the season with a great opening victory at La Baule in France, but form has been inconsistent and they are currently lying fifth on the table. This week’s Belgian team will be chosen from Donaat Brondell, Dominique Joassin, Ludo Philippaerts and his son Nicola, and Koen Vereecke. And Chef d’Equipe Philippe Guerdat will be keen to increase the two-point advantage his country has so far established over the British who lie sixth as tomorrow’s action begins. British team manager, Rob Hoekstra, describes his squad as “a good mix of young and experienced riders”, and with Tina Fletcher, William Funnell and Robert Smith amongst them he certainly has plenty on the experience side. The youth is provided by the rising talent of 19-year-old Alexandra Thornton and 22-year-old Daniel Neilson. For the Irish, tomorrow is another big challenge. But they showed the courage and determination that is their hallmark with a strong third-place finish in Aachen last week. And if Robert Splaine’s side – chosen from Shane Breen, former Irish Army Equitation School rider Capt Shane Carey, Dermott Lennon, Clem McMahon and Capt David O’Brien – can hold their ground, then they might just manage to improve their country’s situation by tomorrow night. McMahon’s young stallion, Pacino, was superb in Rotterdam last month. This is a team with a chance to put a smile on their team manager’s face, but it is all to do, and the story will unfold as their pathfinder strides into the ring tomorrow afternoon…. For further information on the sixth leg of the 2012 FEI Nations Cup series in Falsterbo, Sweden on Friday 13 July go to website www.falsterbohorseshow.se or contact Press Officer Malin Fredriksson, Email press@falsterbohorseshow.com Tel: +46 7029 24679. 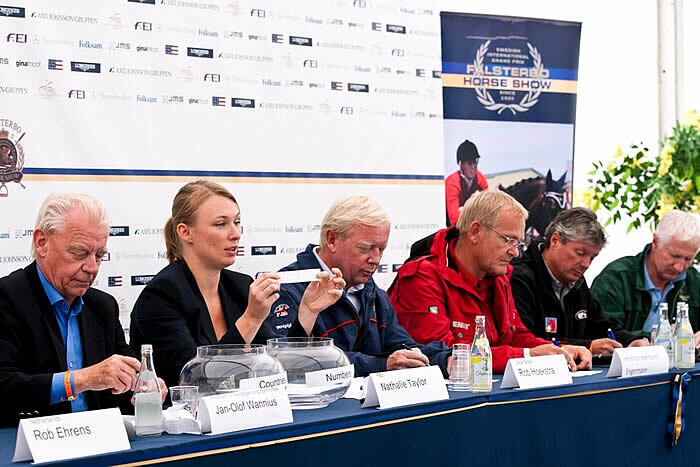 Falsterbo, Sweden presents the sixth leg of the FEI Nations Cup 2012 series. Germany will be defending champions, having won at the 2011 Swedish fixture. France finished second on that occasion, ahead of the host nation in third. Germany currently has a lead of 11.5 points at the top of the FEI Nations Cup leaderboard. Sweden and Ireland carrying 18 faults each and occupy the last two places on the league table. Two further legs of the series will take place following tomorrow’s competition – at Hickstead (GBR) on Friday 20 July, and in Dubiln (IRL) on Friday 17 August. The FEI Nations Cup is the oldest of the FEI series. The team competition has existed for over a century, but it was in 1964 that the Nations Cup became a series when a ranking was established. Since then it has gone through a number of transformations, run as the President’s Cup, the Prince Philip Trophy, and more recently as the Super League. In recent years there has been an awareness that the concept was in need of a major review and the proposed restructuring process is seen as key to ensuring the future of the series. The FEI Nations Cup Top League is currently run at eight selected European venues, but the concept was debated at the Sports Forum in Lausanne and, following further consultation, proposed changes to the format will be voted on at the General Assembly in Istanbul (TUR) in November. La Baule (FRA), 10-13 May; Rome (ITA), 24-27 May; St Gallen (SUI), 31 May – 2 June; Rotterdam (NED) 20-24 June; Aachen (GER) 3 – 8 July; Falsterbo (SWE) 12-15 July; Hickstead (GBR) 19-22 July; Dublin (IRE) 15-19 August. FEI TV: enjoy LIVE programming, highlights, interviews and archive footage at www.feitv.org.